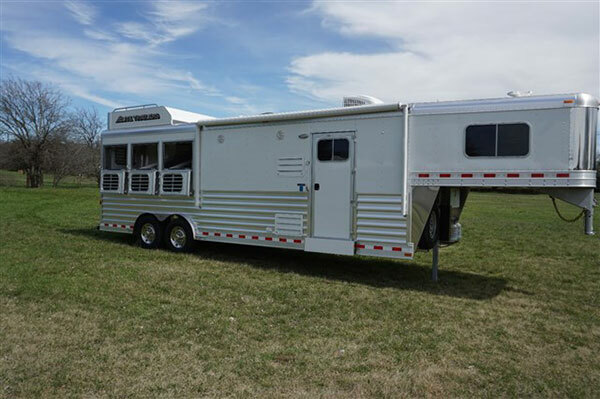 We specialize in custom order trailers to meet our customers requirements. For more pictures click on the picture below. 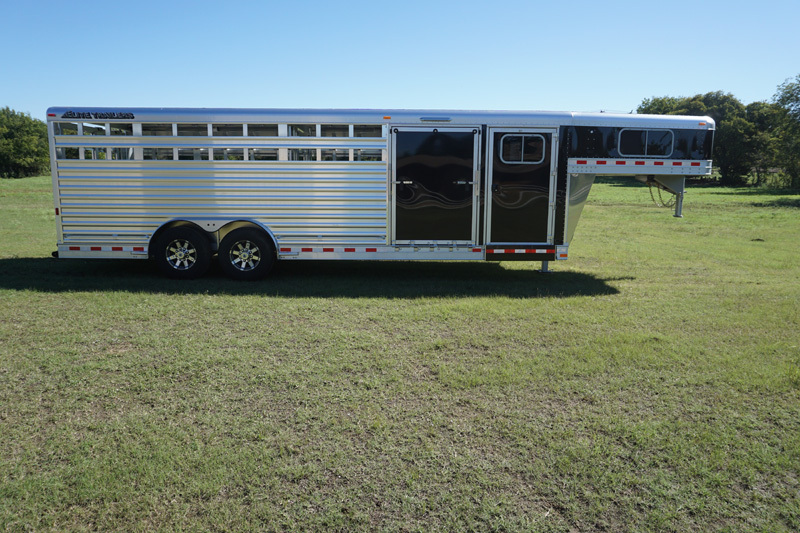 Description: First Class 2019 Custom Deluxe 3 Horse Elite with 10'8" Liv. Qtrs Finished in Beautiful Knotty Alder Wood by Outback Customs. 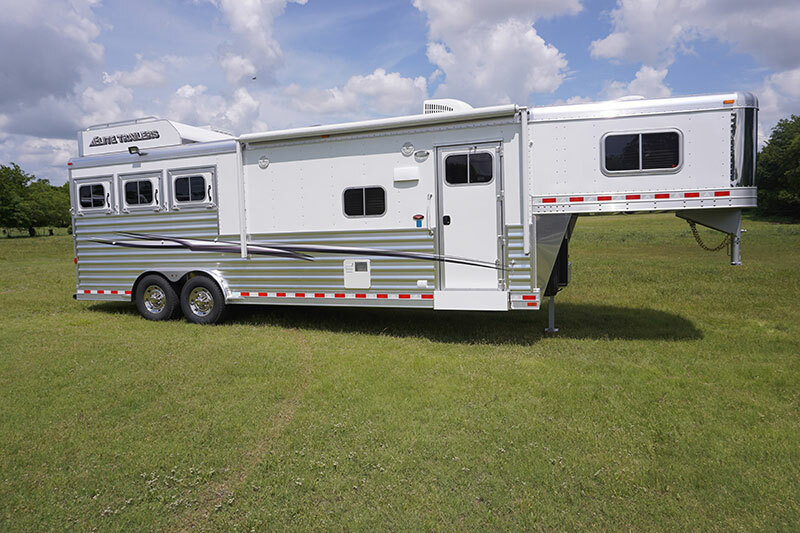 Trailer Equipped with: Hydraulic Jack, Onan 4000K Generator (Roof Mounted in Vented Box on Hayrack), Spare Tire, Elec Awning., Duel LP System, Triple Battery System, Sliding Screen & Fold Down Step at Entrance Door, Walk Thru Door to Horse Area, Black & Grey Exterior Striping, Drop Down Windows on both Head & HIP Sides, Drop Down Bars on Head, Escape Door on 1st Stall. Removable Lower Panel on 1st Divider, Managers on 2nd & 3rd Stalls, Collapsible Rear Tack with Removable Lower Panel on 1st Divider, Managers on 2nd & 3rd Stalls, Collapsible Rear Tack with Removable Saddle Racks & Swing Out Blanket Bars, Horse Area Area is Fully Rubber Lined & Padded, 3 LED Outside Load Lights, Two Way Roof Vents over each stall. Living Quarters Equipped with: Ducted A/C & Fuirnace Heat, Memory Foam Queen Mattress, Day/Night Shades, 72" Leather Fold Down Sleeper Sofa, Fold up Dining Table, Copper Coated Kitchen Sink, Two Burner Recessed Cook Top, Microwave, 6 Cu Ft. Fridge with Freezer, Multiple Cabinet & Closet Storage Areas, Entertainment Center includes TV, AM/FM CD & DVD Player. There are two 37 gal Waste Tanks, 50 Gal Fresh Water Tank & 6 Gal Hot Water Heater, Water Monitoring system for tanks & Remote Start Generator. Bathroom Equipped with Large Radius Shower with Skylight. Copper Coated Sink, Porcelain Toilet, Large Medicine Cabinet, Vanity & Mirror, Elec Powered Roof Exhaust Vent, Double Door Closet & Full Length Mirror on BR side of Pocket Door. 3 Swing Out Blanket bars in RT.